Larry Hester may be blind, but he can still see there’s plenty in life more important than money. Like chatting with old friends. Or walking hand in hand with his daughter to lunch. Or working with his brother in a business founded by their father. 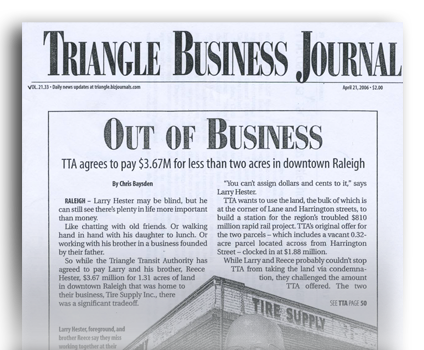 So while the Triangle Transit Authority has agreed to pay Larry and his brother, Reece Hester, $3.67 million for 1.31 acres of land in downtown Raleigh that was home to their business, Tire Supply Inc., there was a significant tradeoff. “You can’t assign dollars and cents to it,” says Larry Hester. TTA wants to use the land, the bulk of which is at the corner of Lane and Harrington streets, to build a station for the region’s troubled $810 million rapid rail project. TIA’s original offer for the two parcels – which includes a vacant 0.32-acre parcel located across from Harrington Street – clocked in at $1.88 million. While Larry and Reece probably couldn’t stop TTA from taking the land via condemnation, they challenged the amount TTA offered. The two sides reached the $3.67 figure in mediation, preventing them from having to argue the case in a courtroom, a development that TTA General Manager John Claflin wouldn’t have relished. “It’s a crapshoot then,” Claflin says of having to go to court. “You’re taking a chance.” The settlement awaits the approval of the TTA board. The Hesters’ story has been perhaps the most compelling human element of the saga of the Triangle’s rail project, which has become mired in doubts about whether it will ever be built. Despite such doubts, Claflin says simple momentum keeps the agency buying land. He says TTA is continuing only with land acquisitions on which condemnation proceedings had begun. If the agency tried to stop a condemnation, he says, land owners could force TTA to buy the property anyway. “In our case, it was best to go forward with condemnation,” he says. The purchase of the Hesters’ land gives ITA ownership or control of 92 percent of the land it needs for the rail project. The agency has spent 82 percent of its $49.9 million land acquisition budget so far. Frank Hester founded the tire business in1967 and eventually turned it over to his two sons. The brothers served a downtown clientele from a strategic location with little competition but plenty of state government workers who liked being able to walk to the office after dropping off their cars. Larry, an affable 57-year-old originally from Durham, developed an eye disease early in life that rendered him blind at age 35. He was able to continue working at the garage because he had become so familiar with where everything was. Every morning, he and Reece, now 47, would get a chance to talk about family and the business over coffee as they opened the store. Knowing that TTA was going to take the land, the brothers closed the business on Dec. 31, 2004. “We thought and prayed hard about it for a long time,” Larry says of the decision to close the business. “It was one of the hardest things I’ve ever done. “I had blood, sweat and tears in that place,” he says. Larry has retired, while Reece took a job as executive director of the North Carolina Tire Dealers Association. It’s quite a change for both. “One of the things I miss is my brother and being able to work with him,” Reece says. To resolve the dispute over how much TTA would pay for the land, agency representatives met with the Hesters and their lawyers at Cranfill, Sumner & Hartzog on April 7. Each side presented arguments to a mediator, who then put the two parties in separate conference rooms. Over the course of the day, the mediator went back and forth between the two sides trying to strike a deal. The process took about nine hours, as there were different estimates from different appraisers representing both sides. Finally, a deal was struck that delivered millions to the brothers, but it didn’t come without strain.